Grape jelly and meatballs? Really? That's what I said when I found out that the popular party meatballs consisted of three ingredients: frozen meatballs, grape jelly, and barbecue sauce. And you cook them in the slow cooker. How easy is that? These are great appetizers for a party. They are also tasty for dinner. Serve them over some rice, couscous, or quinoa with a veggie and your set for dinner. The recipe amounts below are large. I halved the recipe for my family (we were also having other treats too) and it worked perfectly. *This recipe works well halved as well. 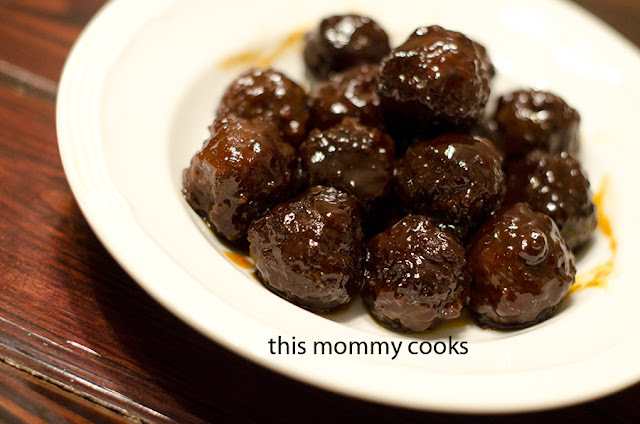 Pour the meatballs, grape jelly and BBQ sauce into your slow cooker and stir well until combined. Cook the mixture on low for 6-8 hours or on high for 2 – 2 ½ hours until completely cooked through (stirring occasionally). Oh how I LOVE simple recipes like this one. Meatballs look mouth-watering, and what could be easier? Thanks for sharing.